Original SWAT 1254 Men's Metro Air 5" WP Side-Zip Boots FREE SHIPPING! Stay comfortable throughout an entire shift with Original S.W.A.T. 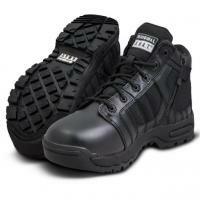 's 1254 Men's Metro Air 5" WP Side-Zip Boots. Designed to handle any situation, durable rubber outsoles and the waffle-style traction pattern ensure stable footing while ladder grip control prevents nasty falls. Engineered for true all-day support and comfort, custom molded EVA midsoles, nylon shank and a texon stability platform give the support needed to prevent foot fatigue. A custom molded heel counter and toe box work together to cradle the heel and arch, locking your foot to the midsole and preventing painful over-pronation. For added comfort, this boot is built with a foam-padded and gusseted tongue that work together to allow for maximum breathability while keeping irritation from dust and debris out. Because durability is a priority, the Metro Air is constructed from quality leather and the heel and toe are stitched with 3-ply bonded nylon thread for maximum service life. ©2002-2019 CopsPlus.com: Original SWAT 1254 Men's Metro Air 5" WP Side-Zip Boots FREE SHIPPING!